I drove home tonight with the sun roof open and a cool almost-a-summer-evening breeze wafting through the car. A sliver of a fingernail moon was smiling down on me, and I had to smile when I glanced at the empty box on the passenger seat next to me. Tonight I was an Official Book Giver. Thirty copies of Alice Sebold’s The Lovely Bones had been in that box just forty or so minutes earlier. My task tonight, on World Book Night, was to give away these books to anyone who wanted one, and especially to people who might not regularly pick up a book to read. At first, I had somewhat of a dilemma deciding on a location. And then I settled upon Whiskey Row, our little city’s main drag. Whiskey Row used to be more notorious, with nothing but bars lining the street. Today there are more art galleries and boutiques than bars, but on most evenings you can bet on an encounter with a colorful personality there. But before arriving at the Row, I decided to stop for a coffee, not quite sure how this April evening might wind up, temperature-wise, and completely unsure of how long it might take to give away thirty books. And while in the drive-through, it dawned on me that I could start right now. I didn’t have to wait until I got to Whiskey Row. So I gave my first book to the barista who seemed perplexed and grateful all at once. She had at least heard of The Lovely Bones. I parked in front of the Palace, first opened in 1877 and claiming to be Arizona’s most well-known frontier saloon. I organized my box of books and stepped out onto the sidewalk with a smile. Others wanted to know what the book is about. And that’s when I realized that the topic of The Lovely Bones isn’t exactly an easy one to just blurt out to strangers. “It’s about a young girl who is raped and murdered,” I would begin. 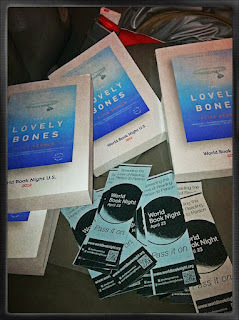 Then I would stop and tell them about World Book Night, and how the goal is to get people interested in reading again. Usually by then most people realized that I wasn’t peddling some sort of religious blarney, and they’d take the book. The odd thing was that I found myself thanking them for taking the books, instead of the other way around, although most did acknowledge it. I think most were too puzzled to think of it. After all, when was the last time, in our there’s-a-sucker-born-every-minute, everyone-and-everything-is-a-commodity, heavily marketed society, that a stranger gave you freely something that you might actually enjoy? The last book I gave away was to a woman who took the time to read the list of books on the back cover: all 30 titles that were being given away tonight. I think she was impressed with that list – I know I am. In fact, I’m thinking that a lot of those titles will occupy my summer reading list. What a cool idea, though, to share the love of reading. I hope to be a Book Giver again next April 23. Why April 23? Happy Birthday Shakespeare and Cervantes! I love this story! And it is such a pleasure to see Mme. Cherry from a completely different perspective, through this blog. So happy I happened on your writings, through your post on Naomi's blog!